Salmon is one of the most transformative foods you can cook sous vide. The time and temperature you use will greatly change the texture of the final dish. For rare and mi-cuit salmon, the temperature should stay below 110°F to 115°F (43.3°C to 46.1°C). At 120°F (48.9°C) it will begin to become flakey, which tops out at around 140°F (60°C) with a more traditional texture. If I can find high quality salmon I prefer it cooked at 122°F (50°C) until heated through, 30 to 60 minutes. I usually brine the salmon in a 5% salt solution for 10 minutes. It firms up the flesh and reduces the amount of albumin in the finished dish. 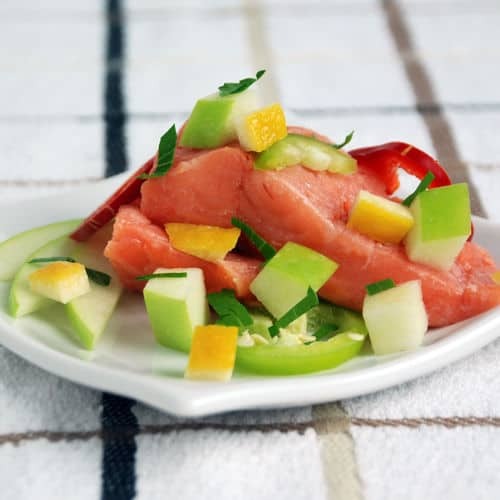 If you would like more information about the modernist techniques, ingredients, and equipment used in the sous vide salmon with apple and jalapenos recipe you can check out the following. Preheat a water bath to 122°F (50°C). Combine 2 cups of water with the salt and heat until the salt is dissolved. Add the 2 cups of cold water and let the water cool to room temperature. Remove the skin from the salmon. Cut it into 1" by 3" pieces (25mm by 75mm). Place the salmon into the salted water and let sit for 10 minutes. Remove the salmon and lightly pepper it then place in a sous vide bag and seal. Cook the salmon for 30 to 60 minutes, until heated through. Combine all the ingredients and blend together until fully emulsified. The vinaigrette can be made several hours ahead of time and refrigerator, then whisked together before serving. Cut the apple into 1/4" (7mm) cubes. Remove the salmon from the sous vide bag and pat dry. 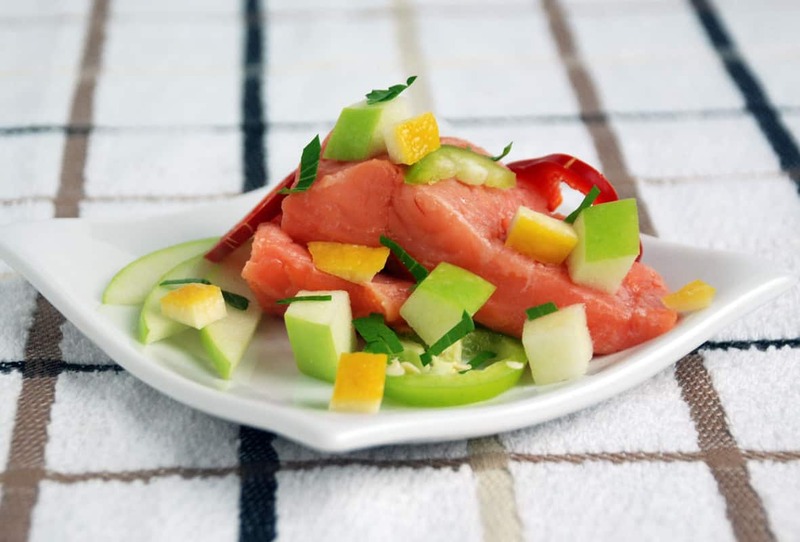 Place a section of fish on a plate then top with some diced apples and a jalapeno slice. Add some lemon confit and parsley to the top then drizzle with some of the jalapeno vinaigrette. Before serving I like to smoke the salmon using a smoking gun or other smoker. After removing the salmon from the bag and patting it dry set it on a plate. Place a bowl or other container over the salmon and run the tube from the smoking gun under it. Fill the container with smoke and let sit for 1-2 minutes. Remove the salmon and continue plating. I also will blend in 0.15% xanthan gum to the vinaigrette so it better coats the salmon and vegetables.